It's that time of year when we start using (eating) what we've put up. Sometimes the transition is a little tough for me. Going from squirreling away to emptying jars is doing a 180 and it takes some getting used to. Except for potatoes and butternut squash, everything that's been put up this year is as follows...Sorry the image isn't clear. It was this or retyping it all. I chose this. In an attempt to be deliberate about using it up, I'm going to start sharing my weekly menus in the margin. No longer are the days of using whatever is ripe in the garden. If we kept that up, we'd only be eating lettuce, spinach and leeks. Not a terrible idea, but still. I hope the menus inspire you to use what you've put up and help with meal ideas. As we approach Christmas, keep in mind your fellow readers as you shop for gifts. I've updated the list of reader Etsy shops in the sidebar. If your shop was empty, I took it off the list. Once you replenish, let me know and I'll be happy to add you back in. 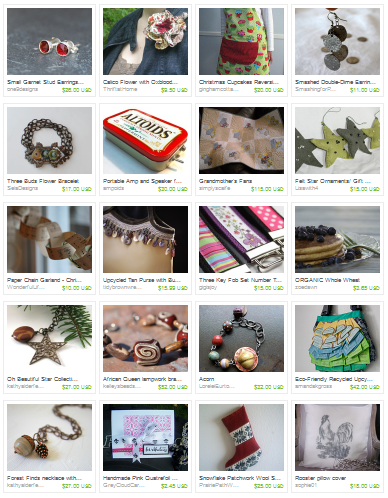 I've updated my favorites from everyone's shops and those can be seen in the Etsy thumbnails in the margin. I'm working on finding out how I can display more of the favorites as currently the thumbnail showcase only holds sixteen. You are some talented folks. If you are a regular reader and you'd like your Etsy shop or hand made craft website to be included, please email me. I have a couple (possibly three) giveaways lined up between now and Christmas from some of your Etsy shops. If you'd like to give something away from your shop, please let me know this as well. So excited to see your tally. It's amazing to add it all up isn't it? Lot's of hard work during summer months. (and beyond) I agree with you on shifting to emptying the jars instead of filling them. Each time I place an empty back on the pantry shelf I get a little panicky that I didn't can enough to get us thru. I see that you froze grape pie filling, I've never considered freezing my pie filling. I will have to give that a try. I'm a fellow Mennonite, homeschooling mom who also has trouble transitioning from food preservation to food EATING. ;) Just discovered your blog and love it. Thanks! 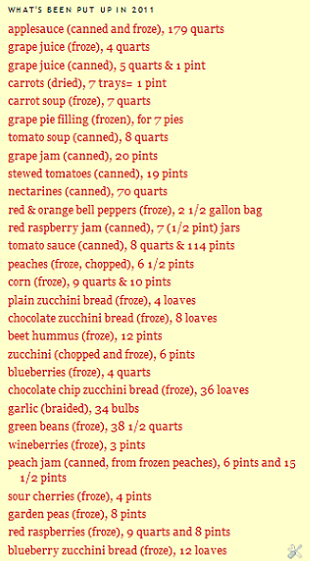 We have tons of veggies and soups put up but not so much for fruit (oh the envy I am experiencing upon reading about your nectarines and applsauce:). So when I use a jar for supper it's almost painful to watch it be scarfed down in mere minutes by my appreciative, hungry family. I constantly have to remind myself this is why we do it - to enjoy the fruits of our labor. So impressed by the tally!! Will have to share with the hubby - he's the grower, I'm the cooker. I hate the transition. I worked so hard to get those jars on the shelf! But, that's the purpose, I suppose. I'm glad I'm not the only one who has trouble opening up jars that I worked so hard to preserve! Your list is impressive. We had so much trouble with tomato rot this year, that I actually didn't get much put up in the way of tomatoes--which makes me a bit sad. However, I have so many apples sitting in the cool garage just waiting for next weekend. It's going to be an applesauce/apple butter party in our kitchen! Very, very impressive tally. We did pretty well, too, for urbanites with a small yard. It feels good to have food put up for the winter. And thanks for the Etsy shout out!